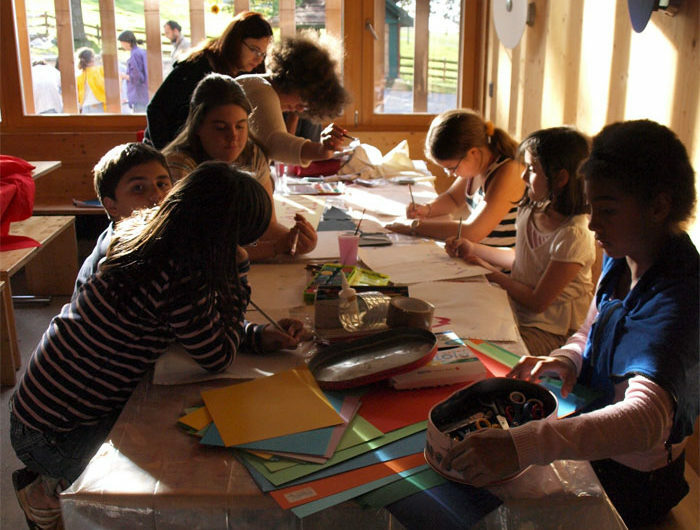 For fifteen years, the youth branch of ATD Fourth World, under the banner of Tapori, has met three weekends a year, bringing together twenty or so children from throughout French-speaking Switzerland, some coming from a background of poverty and exclusion, others from less challenging circumstances. These gatherings are designed to allow children from very different backgrounds to meet each other, with particular support for those who have suffered exclusion in their neighborhoods or schools. Without this opportunity, such encounters would rarely happen. One particular weekend, we welcomed 18 children, some of whom had been coming for many years. Some others who often came were not among us that time. Alexis had got back late to the foster home where he was staying and missed our meeting time. No one had picked up the phone at Fabien’s house. Perhaps his mother didn’t want to speak to anyone after a particularly hard week. We also welcomed some children, like Théo, for the first time. Théo, nine years old, was living with his mother, two brothers, and his sister in a Swiss town. We knew the family well and were aware of their isolation. We ran a workshop based on the true story of two children from Africa, Ono and René. Reading these types of accounts allowed some children to discover that they were not alone in enduring teasing, being excluded at school, or living in poverty. We started with small groups of four or five children. Each of them learned about René who made an effort to get to know Ono, even though the other children called him “crazy” because he fell asleep watching them play football after spending the night fishing. The other children in the story only see his dirty clothes and don’t want to play with him. Théo spent a lot of time with Kevin, who also has a difficult life. The two of them spent hours building pyramids with blocks. In the evenings after dinner, it was games of hide-and-seek with all the children. Théo always had a big smile on his face afterwards, even if it annoyed him sometimes when he forgot people’s names! Later on, Théo came back for another visit. For us, it was a sign that he felt comfortable at Tapori. Like Théo, so many children tell us during Tapori weekends just how important friendship is for them to feel good in life.